How Sharp is the Sharpe-Ratio? If popularity was the only measurement for risk metrics, the Sharpe ratio would tell us everything we need to know. 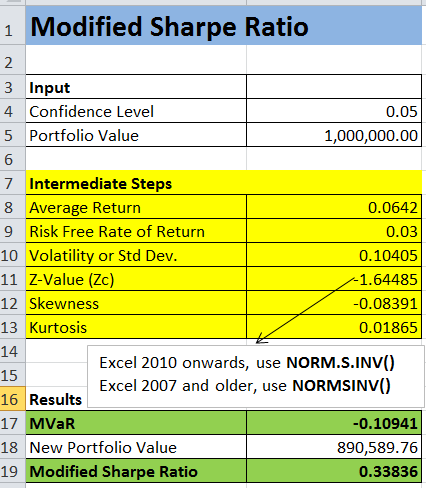 Modified Sharpe Ratio covers further spectrum of risks in the field of investing. Any discussion on risk-adjusted performance is incomplete without touching on the topic of Sharpe ratio or Reward to Variability which divides the excess return of a portfolio above risk free rate by its standard deviation or volatility. Sharpe ratio works well for normal-distributed returns, where the entire distribution can be explained through mean and variance alone. It is not sensitive to extreme loses and underestimates risk, and in such cases Sharpe ratio should be avoided. Its leading shortcoming is the fact that financial market returns do not follow a normal statistical distribution. The non-random part of the returns is commonly measured by Skewness, a measure of probability asymmetry, and Kurtosis (with “fat tails”) which measures how peaked the random variables are. Let’s say we have a portfolio with 8% risk premium and 25% volatility. The VaR is then roughly equal to 33.25% using a 95% confidence interval (-8 + 1.65*25, Z-value = 1.65 for 95% CI). As per VaR, there is a 95% probability that the losses on the portfolio will be restricted to $332,500 or 33.25% of a $1 million portfolio. We can flip that around and say there’s a 5% probability that the losses could exceed $332,500. VaR has limitations, starting with the assumption that returns are normally distributed. The attached spreadsheet simplifies the calculation for you. It calculates MVaR and Modified Sharpe Ratio once you fill in the annualized portfolio returns, confidence level, and portfolio amount. For calculating Z-value, use NORM.S.INV() for Excel 2010 and newer versions. Use NORMSINV() for Excel 2007 and earlier versions.